Four Avdiyivka residents were killed by shelling. Four Ukrainian servicemen were wounded in the antiterrorist operation (ATO) area on 13 May as a result of 61 shelling attacks by pro-Russian militants along the entire line of contact, the ATO HQ said in its morning update. In the maritime (Mariupol) sector, the militants carried out 33 attacks. 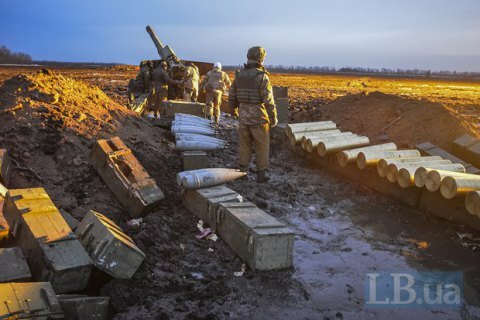 They fired with 120-mm mortars and 122-mm artillery on the ATO forces' positions near Vodyane. The village's suburbs and Shyrokyne came under fire from infantry fighting vehicles, 82-mm mortars and small arms. The militants fired with an anti-aircraft system near Hnutove, with small arms, grenade launchers, heavy machine guns and occasionally with 82-mm mortars near Mykolayivka, Pavlopil and Chermalyk. Maryinka's defenders came under fire from infantry fighting vehicles and 120-mm and 82-mm mortars. In the Luhansk sector, the ATO HQ registered eight armed attacks by the militants. Late at night, the Russian terrorist troops fired on the ATO forces' positions near Novozvanivka with 122-mm artillery and 82-mm mortars. Troyitske was pounded by 120-mm and 82-mm mortars and tank weapons. The militants also used 82-mm mortars and infantry fighting vehicle guns near Krymske. In the Donetsk sector, the militants focused on the ATO forces' positions near Avdiyivka and on the Svitlodarsk salient. There were 20 attacks registered in the area. The illegal armed groups systematically fired with small arms, grenade launchers, 82-mm and 120-mm mortars on Avdiyivka's suburbs. One of 122-mm shells hit a private house, killing four civilians on the spot and heavily wounding another one. Near Novoluhanske, they fired with small arms, grenade launchers, 120-mm mortars and a BM-21 Grad multiple launch rocket system on Novoluhanske. The militants also targeted the ATO forces' strongpoints near Pisky, Verkhnyotoretske, Kamyanka, Zaytseve, Luhanske and Troyitske. The enemy used nearly an entire range of small arms and grenade launchers, occasionally 82-mm and 120-mm mortars and infantry fighting vehicle guns. The ATO forces offered adequate response to the enemy.